In Part 4 we looked at the role landing pages can play in your overall marketing strategy. In this post we are going to discuss how paid advertising can supplement your efforts. In the Meantime. . .why not Paid Advertising? When you are first establishing your digital brand, you really can’t relay on your own blog or Facebook page to generate much traffic. In the beginning, you can speed things up a bit by investing some dollars in paid digital ads. Tactics like Pay Per Click and native advertising can give you brand new marketing efforts a much needed boost. One of the downfalls of paid ads is they can be annoying and they can get really expensive really fast. 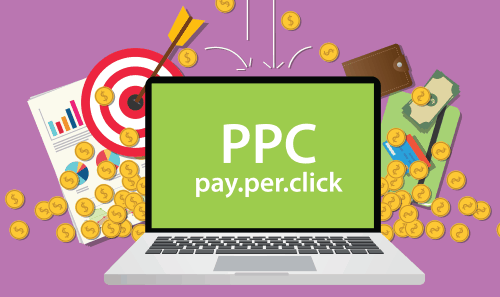 So let’s go over a few ways you can make your pay-per-click (PPC) ads less annoying and more enticing. The reality is that no one is ever going to say. “I LOVE ads!” even if you have the greatest ad ever. But, if your ads are done right they can provide enough value that people will actually click on them. Let’s dive in. When Should You Use Paid Advertising? Good question. The best way to use paid advertising is to push traffic to a page that has a specific call-to-action. An offer to subscribe to your blog or to download an e-book, whitepaper or signing up for a free trial of something are all good examples. You know, those landing pages we learned about in the last installment. You wan to avoid just paying for traffic. You want to pay for traffic that turns into subscribers and leads. Another thing to keep in mind is you don’t want to just drive traffic from the ads you place to your home page where there’s no specific next action to take: that’s a lot of ad dollars that are going nowhere. Search Engine Marketing (SEM), or paid search, is one of the biggest areas of paid marketing. This is where you actually pay for search terms people are entering into search engines like Google and Bing. The way it works is you place a “bid” on a certain keyword and your bid is compared to the bids of others on the same keyword phrase. Your ad will show up above organic search results for a set amount of time until you exhaust that ad’s budget. For example, if you were to bid on the term “website design costs”, your ad would appear on the page displaying search results for that keyword. Each search engine has its own version of paid search, including Google Adwords, Bing Ads, and Yahoo! Search Ads. Always use targeting so your ads get served to the most relevant audience. You can target by behaviour, location, device type and more. For example, if you’re a restaurant in Nelson, BC, you really don’t need to be targeting people who live in Singapore. Not the best bang for your ad spend. Set up a brand name campaign — this is when you bid on your company’s name. For example, we would bid on “1 Source Web” so that if someone searches for that term, we’re displayed in the ad section as well as in organic. Don’t get caught in the trap of bidding on competitors’ brand names — you’ll burn through your entire ad budget before you know it. The key here is to be specific with your target. Bid on keywords related to your brand. For example, 1 Source Web might bid on the term “website design” which is closely associated to our brand. Optimize ads for quality score by linking them to relevant landing pages. If your ad points to a page that a search engine doesn’t think is actually related to the ad, your ad won’t get served up. Here we are talking about banner ads. This is where you pay for ad space on third-party sites. But you have to ask yourself: when was the last time you clicked on a display ad? For many of us, the answer is “never” because these ads have a bad reputation as being distracting, disruptive, and unrelated to anything you might be interested in. While it’s the least effective of the different types of digital advertising, if you do choose to use display advertising, make sure you’re using proper targeting so that your ads are getting served to the right people in the right place. Create a “blacklist” of site types you do not want your ads appearing on. You don’t want your brand on sites that don’t mesh with your content or brand. You don’t want your ad showing up on error pages or pages containing profane language or images. Advertisers like Google Display Network allow you to do this in the account settings section. Always use images — text-only display ads will get completely lost. Take into account how images have performed on other organic and paid channels (for example, see how it performed on your Facebook page or in a Twitter ad). Test your ad copy, too. Create several ads driving to the same landing page. After a day of running, see which ad is performing best and turn the others off. Your ad spend will go a lot further. Native advertising refers to ads that look like they are part of the platform they are on. You may have seen promoted posts in your Facebook news feed, sponsored updates on LinkedIn or maybe promoted tweets on Twitter. They look like a normal update in the user’s feed but are marked as “sponsored” or “promoted” so users know it’s an advertisement. When you combine native advertising with good targeting, which many platforms such as Facebook allow, you can get great bang for your buck. This is because you are able to serve relevant content to the right audience. On Facebook, for example, if you are a marketing agency that works with startups, you could target by location, interests, and job title to show a relevant piece of content to them. Always use images. Ads that use images perform 3 times better than text-based ones. Don’t use hashtags in paid tweets. Each link you add reduces the click-through rate on the website URL you’re actually trying to drive users towards. Create a targeted audience for every ad placement. You might reach fewer people, but targeting by demographics, interests and location can help you increase engagement because your content will be more relevant to a larger portion of your audience. Take advantage of all components of your ad. The call-to-action button and news feed link description to name a couple. Choose what medium your ad is displayed on. If conversions is your goal, consider limiting ads to just the news feeds. If you have a longer form on your landing page, you may want to limit it to desktop-only. LinkedIn is a great platform for B2B companies — so if you’re selling products or services to another company, consider utilizing this platform for high-value clicks. Sponsored updates with video or images tend to perform better than those without. When choosing what content to promote, consider trying these formats out. Use 60 characters or less for the description of your ad so that the text doesn’t get cut off the page. drive the right traffic back to your website. Once you have a fair bit of traffic going and have built up your database with leads, you can use paid advertising to move those leads towards taking further actions and becoming customers. This form of advertising is called paid re-targeting, where you take another run at your existing leads. Say you get 10,000 visits a month to your website. You know that the people visiting your website interacted with it somehow — maybe your content, or your products, or they want to learn more about your company. But you don’t have their email address, which means there’s no way for you to reach them. That’s where re-targeting comes in. You can use tracking pixels (snippets of code on your website) to mark visitors with a cookie. You can then show those visitors relevant ads on display or social and get them back to your site. form to download your e-book called “10 Mistakes to Avoid During the Hiring Process” which is aimed at HR managers. You can take the list of everyone who’s downloaded that e-book and re-target them with more relevant content — moving them over time towards a free recruiting consultation, for example, and getting them to talk to your sales team. Re-targeting is a great way to engage your existing audience across other platforms they might be frequenting without being a nuisance.